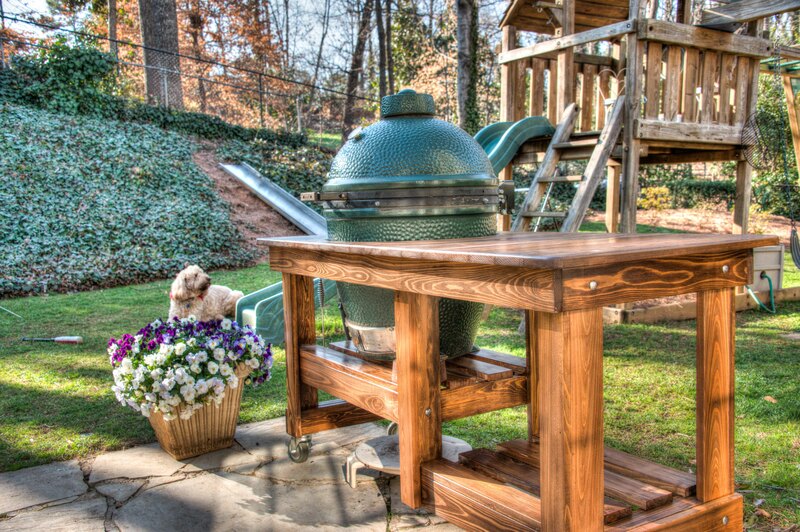 Several years ago Martha gave me a Big Green Egg for Fathers Day. I felt unworthy then and still do now, but it’s a really amazing tool, and until this point has lived in a “nest” with fold down arms. 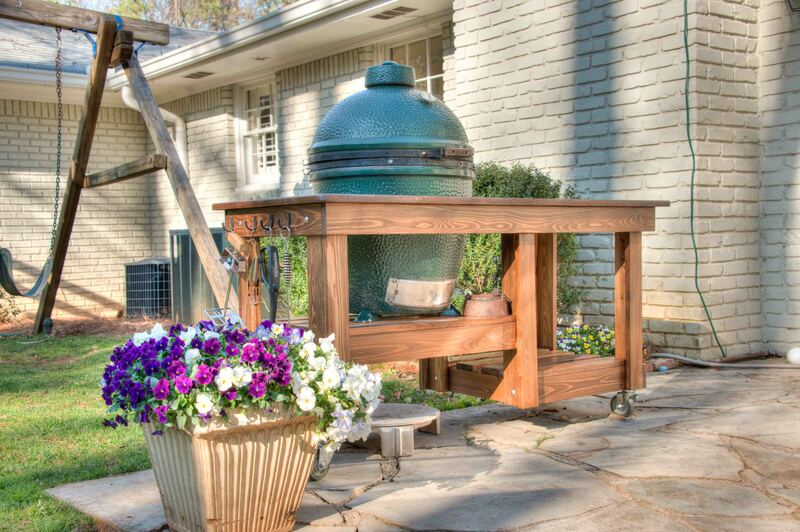 For my 40th birthday Martha sort of gave me a new Big Green Egg table for it to live in. The reason I said sort of was because I had to call the guy and order it, go pick it up, and stain/seal it before I could use it. 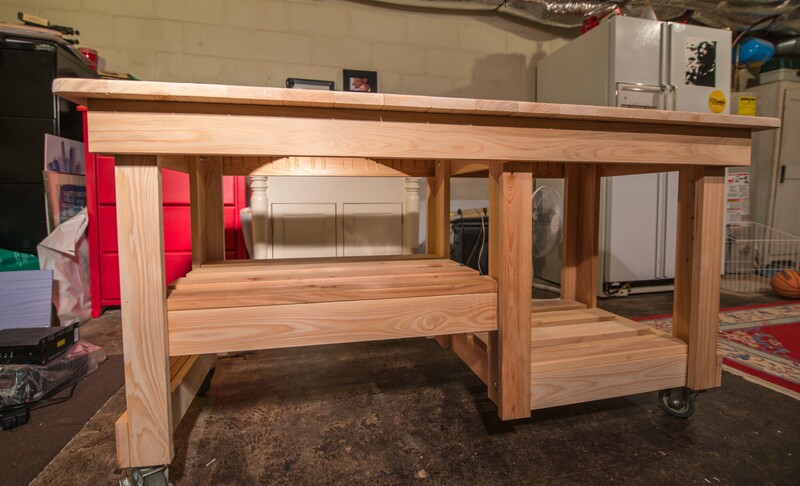 A buddy of hers gave her a link on craigslist of a company in Auburn Ga that makes these unfinished cypress tables for the Big Green Egg. I pulled it up, found the one I liked on their website www.CypressGrillTables.com, and placed my order around 8:30 on a Thursday morning. It took me about 45 minutes from Buckhead to drive to their shop which is located off of Highway 316 on the way to Athens. I got there at 10:30, loaded up the table, in and out in five minutes or less. 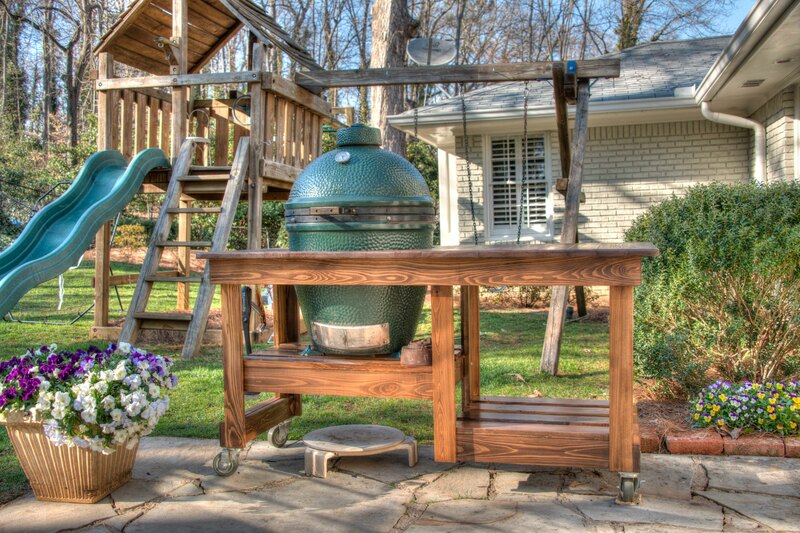 To get it finished I went to Ace Hardware on Roswell Road as they are all knowledgeable in the Big Green Egg arena. They pointed out everything I would need to go from what I had, to the finished product. I decided that I wanted it to be a darker color to offset the beating it will take over it’s lifetime, burn marks, dents, scratches etc. I used MINWAX Wood Finish (Special Walnut 224) which gave it a nice rich brown color. I applied one coat of that and let it dry overnight. After the stain dried I put on the first coat of the sealer which is MINWAX Helmsman Spar Urethane. It is a clear semi-gloss water based sealant. Now this had to be applied 3 times all over the table which took a few days to get through. The can actually says 4 coats are needed for exterior use but I went with the guys recommendation at Ace and did three. The final touch was to go to Lowes and buy some robe hooks that might go on your bathroom door. 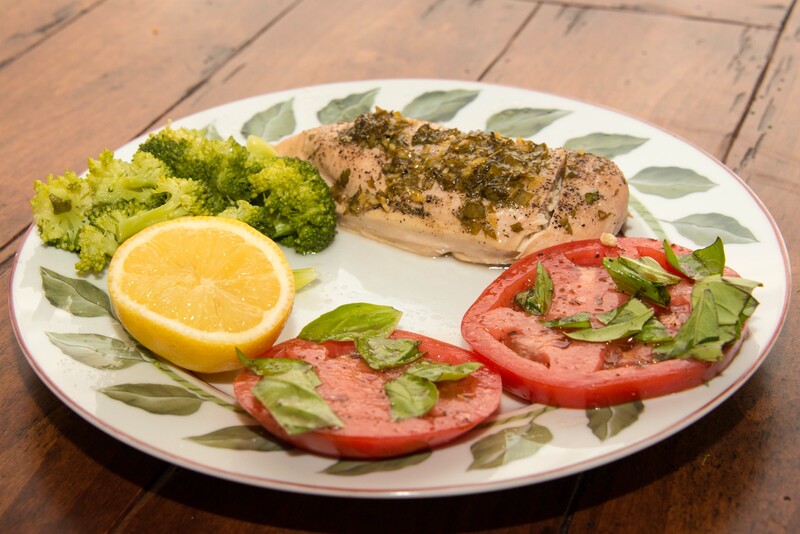 They are an oil rubbed bronze and look great with the table. Here are a few pictures of how it turned out. I could not be any happier with the results.